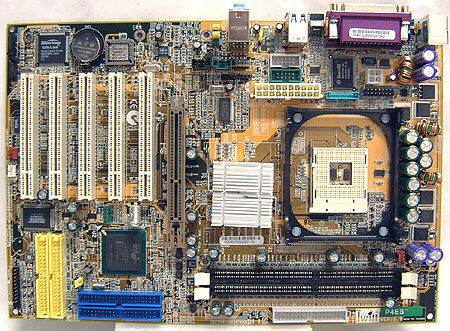 The second of Iwill's two entries in this round up is their P4ES Motherboard. The P4ES shares many similarities with the Iwill P4GS as both are value oriented motherboards that try to satisfy consumers looking for the most in one spot. The P4ES has IDE RAID, Serial ATA, 5.1 audio and support for various portable media (compact flash, secure digital cards and memory stick). To top things off, USB 2.0 is natively supported by the ICH4 southbridge and there are five PCI slots should you need to add any devices. 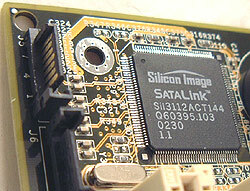 The board uses two DIMM slots which will support a maximum of 2 GB of PC1600/2100 and PC2700 DDR RAM. While it's not really a problem per say, with the IDE connectors in the lower right hand corner it rules out the possibility of using longer (SB Audigy) or full length PCI cards. The two Serial ATA connectors are located in a really far-off and hard to reach spot which doen't make a whole lot of sense. 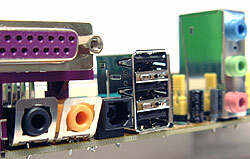 As you can see in the picture above, the two Serial ATA connectors are flush to the lower left hand corner of the motherboard. Depending on your case, you many have a hard time plugging in the Serial ATA cables. The cables are thin, and long enough that reaching the drives won't be an issue. The Iwill P4ES has very little overclocking options in the BIOS which makes it very evident that Iwill are not trying to target the enthusiast market. As much as we may like overclocking, the entire market is relatively small compared to your standard run of the mill customer. Performance and stability of the P4ES proved to be excellent, but then again we would expect nothing less no would we?